Pamela Lockhart founded with Charlotte and Hanna the Distinguished Academy of Governesses. They teach girls in desperate need of honest work like they were and provide governess services and lessons on subjects such as music, needlework and dancing. After Pamela is robbed on the streets of the money for the month’s expenses, the new endeavor is at risk of failure and the crazy demands of a certain Duke are the only chance to avoid the worst. Devon Mathewes, the earl of Kerrich, needs a child and a governess to gain respectability in Queen Victoria’s eyes or the Bank founded by his grandfather will go bankrupt. Does he care about the orphan’s future after his purpose is served? Nope. He’s a selfish and self entitled rake that only cares about himself until… the new governess Pamela shows up on his doorstep! He’s self-entitled, he’s offensive and he’s obnoxious but there’s a reason for his beliefs when it comes to women and love. …hence his request for a plain older woman “not given to fantasizing”. She wore tinted spectacles, he noted, a sign of weak eyes and excessive learning. Her complexion was bloodless and her lips pale. Her brown hair was pulled back so tightly from her face that any sagging around the chin and neck had been reduced—another feminine trick, and one that would scarcely fool a connoisseur such as himself. A tangled, spidery thin net of gray lace covered her hair, and she sported an absurd decoration that looked like nothing so much as two knitting needles stuck in right angles through the knot at the base of her neck. He dropped his monocle and seated himself. “Perhaps you’ll do,” he said. He doesn’t know it at first but none of his requests are fulfilled! Our heroine is definitely NOT what he asked for and the child isn’t what he envisioned. At the orphanage Pamela picks 8 years old Beth and…a “manly lad” she’s not! She’s soft-spoken and has manners because she received an education prior to her parents’ death. After a bit of resistance, Lord Kerrich is convinced by Pamela and, little by little, his life changes. From appalling reasoning such as this..
… to genuine fondness for the child. She doesn’t belive men capable of being faithful and she’s afraid she’ll end up with a broken heart just like her mother. Both Pamela and Devon are disillusioned about love for similar reasons but there’s a major difference: Pamela is not selfish. Kerrich and Lord Reynard leaned against the rail and watched the horses start around the track. – Pamela’s OTT descriptions of how virile, handsome and sensual Lord Kerrich is. – His obnoxious and misogynistic beliefs regarding women and fidelity, his selfish behavior at the beginning. – His belief it was somehow acceptable to forsake contraception so that, through a pregnancy, he could convince her to marry him. “Lord Kerrich, I am a governess. I recognize that most males do not mature, they simply grow taller.” Unwise, of course, to retort so wittily, and she waited, interested to see if he would behave like a typical roue and pout or threaten. “Then I will mount you appropriately.” Realizing what he had said, he wavered between laughter and horror. I ended up forgiving Devon because he ACTUALLY evolves A LOT throughout the story . AND I believe Pamela is the perfect gal to keep him in check! 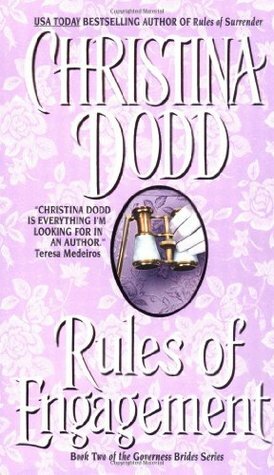 * Rules of Engagement by Christina Dodd is book #3 in the Governess Brides series. Can be read as a Standalone. Triggers: One time she says no while thinking yes. He isn’t a mind reader so… dubious consent. Also, he believes somehow acceptable to forsake contraception so that, through a pregnancy, he could convince her to marry him. Explicit scenes. Recommended to: Historical Romance Readers looking for a heroine in disguise that very much knows her worth, a hero that begins as the worst kind of rake but grows out of it and good banter.